So far in this book we have worked exclusively with applications that present a single view to the user. In practice, it is more likely that an application will need to display a variety of different content depending on the actions of the user. This is typically achieved by creating multiple views (often referred to as content views) and then providing a mechanism for the user to switch from one view to another. 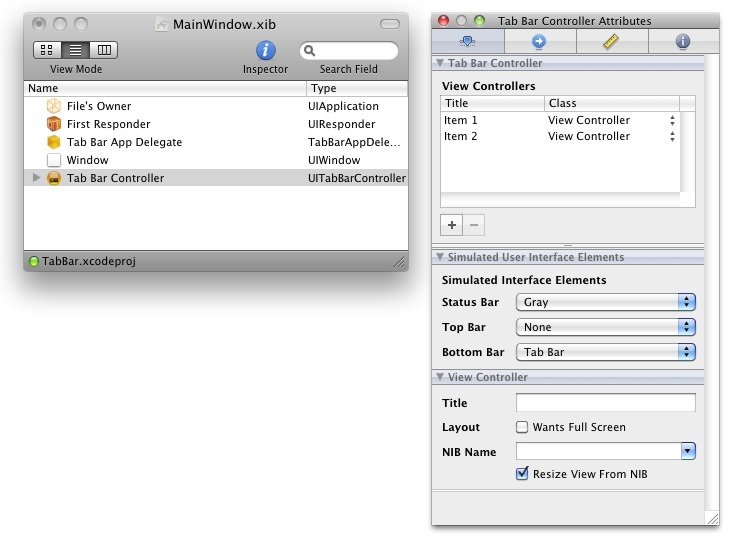 The primary mechanisms for achieving this involve the use of either the UINavigationBar or UITabBar view components. 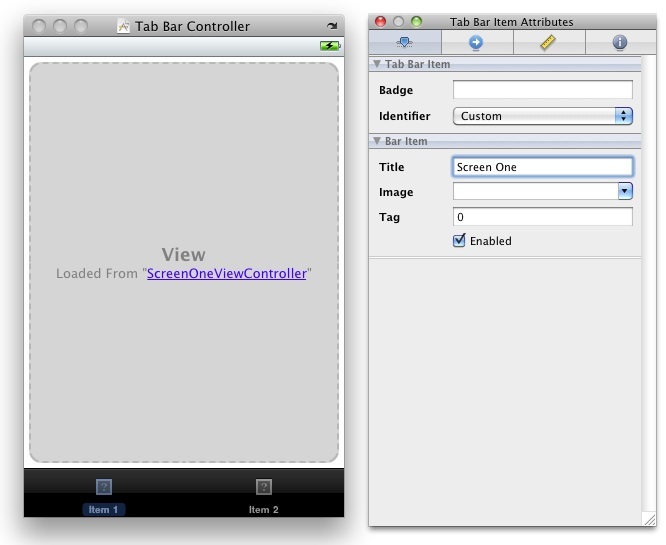 In this chapter we will look at implementing a multiview application using a Tab Bar in iOS 4 iPhone applications. The UITabBar is typically located at the bottom of the screen and presents an array of tabs containing text and an optional icon that can be selected by the user to display a different content view. Typical examples of the tab bar in action include the iPhone’s built-in iPod and Phone applications. The iPod application, for example, presents a tab bar with options to display playlists, artists, songs and videos. Depending on the selection made from the tab bar, a different content view is displayed to the user. In preceding chapters we have talked about the model-view-controller concept in relation to each view having its own view controller (for additional information on this read the chapter entitled An Overview of the iOS 4 iPhone Application Development Architecture). In a multiview application, each content view will still have a view controller associated with it to handle user interaction and display updates. Multiview applications, however, require an additional controller. As we have already discussed, multiview applications need a visual control that will be used by the user to switch from one content view to another, and that this usually takes the form of a tab or navigation bar. Both of these components are also views and as such need to have a view controller. In the context of a multiview application, this is known as the root controller and is responsible for controlling which content view is currently displayed to the user. As an app developer you are free to create your own root controller by subclassing from the UIViewController class, but in practice it usually makes more sense to use an instance of either the UIKit UITabBarController or UINavigationController classes. Regardless of the origins of your chosen root controller, it is the first controller that is loaded by the application when it launches. Once loaded, it is responsible for displaying the first content view to the user and then switching the various content views in and out as required based on the user’s subsequent interaction with the user interface. Since this chapter is dedicated to the creation of a tab bar based application we will be using an instance of the UITabBarController as our root controller. The first step in creating our example application is to create a new Xcode project. To do so, launch Xcode and select the option to Create a new Xcode project. On the resulting New Project screen select the Window-based Application option, make sure that the iPhone option is selected from the Product menu and that Use core data for storage option is turned off. Finally, click Choose… and name the project TabBar. 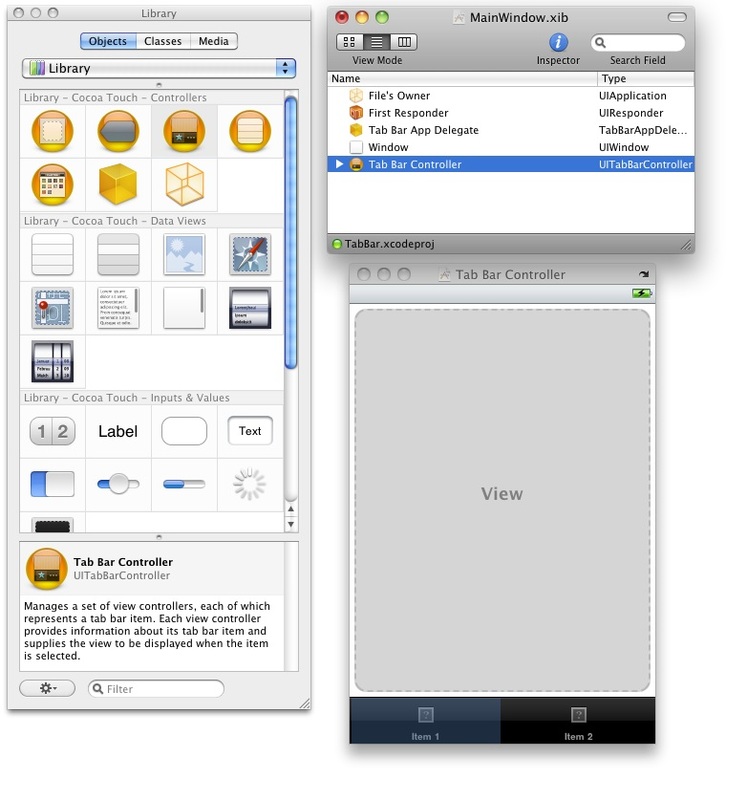 In the left hand panel, verify that the iOS Cocoa Touch Class option is selected and that the current selection in the main panel is the UIViewController subclass icon. Since we also need an Interface Builder NIB file and are developing for the iPhone, make sure that the With XIB for Interface Builder option is selected and the Targeted for iPad option is de-selected before clicking on the Next button. 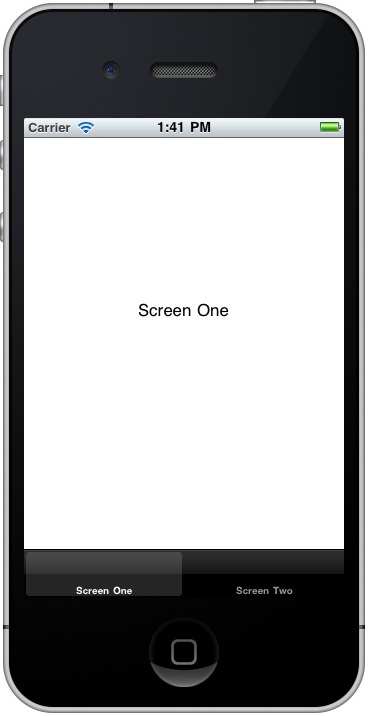 On the following screen, specify ScreenOneViewController.m as the file name and verify that the Also create ScreenOneViewController.h option is selected. Click Finish to create the new view controller class files and corresponding Interface Builder file. Repeat the above procedure to create the second content view and view controller, this time using the name ScreenTwoViewController. Now that we have made the appropriate additions to the app delegate subclass we can now add the root view controller to the project. Since we only plan to implement two content views in this example leave the number of view controllers unchanged. Select the tab labeled Item 2 and repeat the above steps, this time selecting ScreenTwoViewController as the NIB name. Click twice on the icon in the Item 1 tab so that just the icon and text are highlighted. In the Attributes Inspector window, change the Title field to Screen One. If you have loaded any icon images into the project resources you may also specify one using the Image menu. Repeat these steps for Item 2, this time changing the title to Screen Two. Earlier in this chapter we created an outlet for the root view controller in the App Delegate. In order to enable this we must connect it to the Tab Bar Controller instance we have created. From within the MainWindow.xib file hold down the Control key, click on the Tab Bar App Delegate icon and drag the resulting line to the Tab Bar Controller icon. From the resulting Outlets menu, select the tabController outlet. We have now completed the changes that need to be made to the MainWindow.xib file so save the changes (File -> Save) and quit from Interface Builder (Interface Builder -> Quit Interface Builder). The final steps before trying out our application involve creating the user interfaces for our two content views. 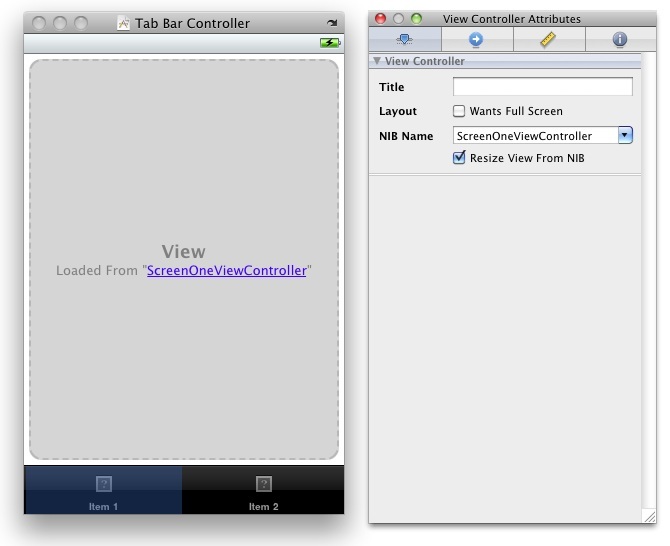 From within the Xcode project window, double click on ScreenOneViewController.xib to load it into Interface Builder. Within Interface Builder, drag a Label object from the Inputs & Values section of the Library window and position it in the center of the View window. Double click on the label text so that it becomes editable and change it so that it reads Screen One. Save the design and exit from Interface Builder. 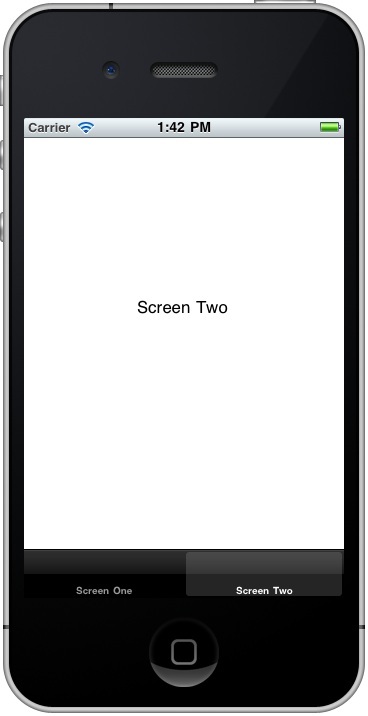 Next, load the ScreenTwoViewController.xib file and perform the same steps, this time setting the label text to Screen Two. Once again, save and exit from Interface Builder.